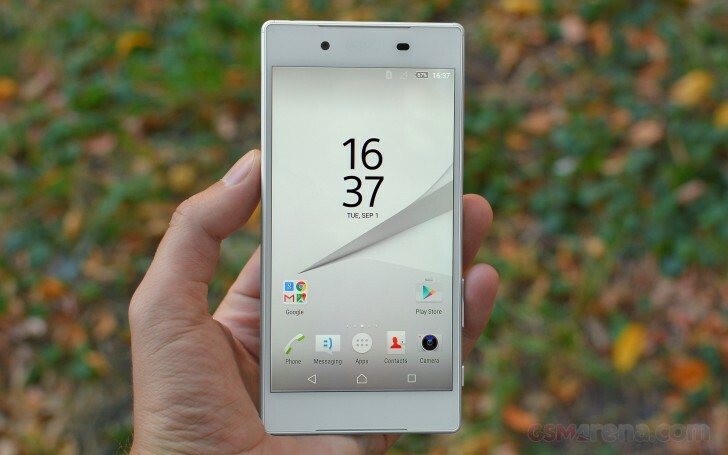 The Sony Xperia Z5 seems to be the least impressive of the lineup. After all, we've seen it a few times over, only bearing different names - much like a Nickelback song. That would be an unfair assumption, though. Immediately recognizable as an Xperia, the Z5 has one notable difference from the established design constraints. The absentee is the iconic circular power button, now replaced by an elongated rounded rectangle. Fingerprint recognition is a must for any flagship in this day and age, and we're no longer surprised to find it in mid-rangers either. Sony was trailing a generation behind in this respect and had to catch up, but where to stick a sensor when you don't have a hardware home button and the glass back prevents you from using a rear-mounted solution? What you do is you rework the OmniBalance power button and put it to another good use. Naturally, you can setup your left index finger too, for when you grab the Xperia with your other hand. Speaking of OmniBalance, that concept is headed for well-deserved retirement. The new design philosophy is dubbed Sense of unity, but we'd require some more convincing to call it entirely new at this point, but Sony reps assure us we're going to see the real difference in design in 2016. Power button aside, the Z5 is largely the same device as the Z3+, all the way down to the lanyard eyelet (a feature, precious to some, but bordering extinction, mind you). The dual-glass design is here to stay, but Sony has spiced it up by giving the back cover a frosted effect. It's a huge stride in the right direction, as the older models were a nightmare to keep clean. Impossible, quite frankly. The new back cover no longer looks like a fingerprint mess. The two slabs of unspecified-make "Chemical tempered glass" are held together by an aluminum frame, now with the Xperia logo etched on the side. It has a fine-grained finish to match the back, with just the right amount of sparkle. Sony is persisting with the bumper corners, and though some of us aren't fans, there's probably sound reasoning behind their existence. The principal control layout won't surprise anyone, though it's gotten a questionable tweak. While the power button/fingerprint reader is where you'd expect it to be, the volume rocker sits quite low on the right side and requires a somewhat unnatural finger orientation to access. The two-stage shutter button, which is another of the more exclusive features, is in its customary position. Sony was proud to go capless with the microUSB port on the Z3+ and the Z5 doesn't take any backward steps here. The SIM/microSD card slot does have a plastic cap though, but how many times do you pop that one open, compared to using the microUSB for charging? Of course, the IP68 certification for protection against dust and water ingress remains. You can be sure we would have been vocal, had it not been. Interestingly, the Xperia Z5 measures exactly the same as the Z3, while the Z3+ inbetweener was a good 0.4mm thinner. We would point the finger at the fingerprint sensor, which needed more room on the side. What it cannot explain is why the Z5 weighs 154g. That's a whole 10g more than the Z3+, but also 2g heavier than the non-plus Z3. All that while bringing battery capacity further down to 2,900mAh. Intriguing battery tests await us. Sony has always had unorthodox color options to complement the obligatory white and (graphite) black. This time around the Xperia Z5 can be had in gold and green, as opposed to the predecessor's copper and aqua green (light blue, really).